신라 제32대 효소왕(재위 692∼702) 무덤이다. 신문왕(재위 681∼692)의 아들로서 삼국을 통일한 후 안정과 발전이 있던 시기에 왕위에 올라 서시전과 남시전 등 시장을 열어 물품의 유통을 쉽게 하였다. 높이 4.3m, 지름 10.3m의 둥글게 흙을 쌓은 원형 봉토무덤이다. 밑둘레에는 자연석을 이용해 둘레석을 돌렸으나 현재 몇 개만이 남아있다. 무덤에는 아무런 장식이 없고, 혼령이 머무는 자리라는 혼유석만이 있다. 『삼국사기』에 의하면 702년에 왕이 죽자 이름을 효소라 하고 망덕사 동쪽에 장사지냈다고 했으나, 현재 서쪽에 있는 이 무덤은 망덕사지에서 남남동 방향으로 약 8㎞ 거리에 있어 차이가 많음을 알 수 있다. 따라서, 망덕사지 동쪽에 있는 신문왕릉을 효소왕릉으로 보는 견해도 있다. This is the tomb where King Hyoso, the 32nd king who reigned from 692 to 702, is buried. As the son of King Sinmun who governed the country from 681 to 692, Hyoso reigned amid the stability and development of Silla following the unification and concentrated on improving the marketing structure. 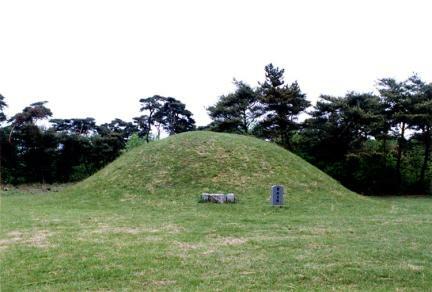 This is a circle ground mound with height of 4.3 m and diameter of 10.3 m. There used to be a stone circle at the bottom circumference, but only several from the circle remained. The tomb does not have any decoration, but the stone is referred to as the place where the spirit remains. According to Samguk sagi (History of the Three Kingdoms), the king was given the posthumous name Hyoso after his death in 702, and his funeral was performed east of Mangdeoksa Temple. Contrary to the record from Samguk sagi, however, the tomb is approximately 8 km away in the southeastern direction from the original site of Mangdeoksa Temple. Therefore, some people believe that the royal tomb assumed to be that of King Sinmun and located in the eastern direction from the temple site is the actual place where King Hyoso is buried.